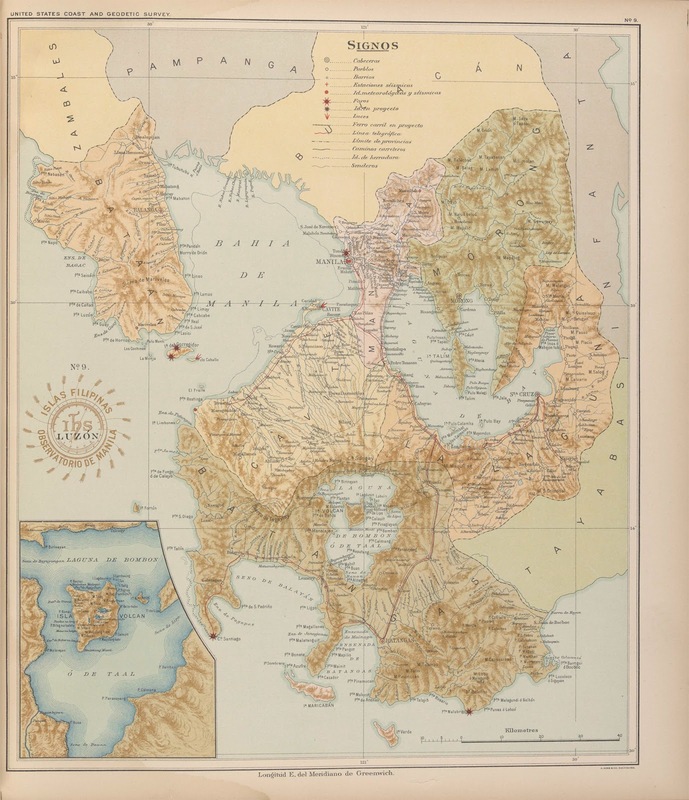 An 1899 map of Southern Luzon, ncluding Batangas. Above is a map of Southern Luzon, including the Province of Batangas, which has been extracted from an 1899 Atlas entitled Atlas de Filipinas: Colleccion de 30 Mapas/Trabajados por Delineantes Filipinos Bajo la Direccion del P. Jose Algue1 (Atlas of the Philippines: Collection of 30 Maps/Made by Filipino Draftsmen under the Direction of Fr. Jose Algue). The map includes, among others, pueblos (towns), barrios, estaciones seismicas (seismic stations), faros (lighthouses), linea telegrafica (telegraph lines), caminos carreteros (cart roads) and ferro carril en Proyecto (railway projects). To the side of is an enlarged view of the Taal Volcano Island in Laguna de Bombon or Lake Bombon, Taal Lake as it is called in the present day. The entire digital version of the atlas may be downloaded for free at the Internet Archive. Please refer to the notes and references section for the hyperlink to the file. 1 “Atlas de filipinas : colleccion de 30 mapas / trabajados por delineantes filipinos bajo la direccion del P. Jose Algue,” online at the Internet Archive.